Dell Neoprene Chromebook Sleeve 11Slip your Latitude 3189 or Dell Chromebook 11 into the sleek and snug Dell Neoprene Sleeve 11 for reliable protection wherever your busy day takes you. 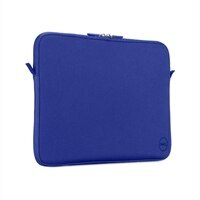 Made for mobility, the versatile sleeve can be used alone or as added protection when tucked inside another bag. The soft interior compartment protects your laptop from scuffs, scratches and dust. Anti-scratch fleece lining and cushioning neoprene help protect your laptop from damaging elements, while two zipper pulls ensure easy access.